I’ve never been a huge fan of the free salsa that comes with your entree at Mexican restaurants. But here’s the thing: Restaurant salsa almost always has lime juice and cilantro in it, and I am not a fan. I don’t mind the taste of lime juice, but I like my salsa to have a bit of body and really stick to the chip. In fact, I’d go so far as to say that the tortilla chip to me is really just a crunchy vehicle for the salsa to hitch a ride on. I’m just fine not tasting the chip at all. As for the cilantro, I hate the stuff. I love cooking with fresh herbs. Give me rosemary or parsley or even dill with my chicken or fish, and I’m a happy snacker. But I have yet to find the dish that includes cilantro without the herb overpowering every other ingredient. Jeez, cilantro. You’re not Diana Ross. Anyway, my point here that that pretty much every restaurant salsa is a no-go for me. Store-bought is my jam. But of course, we’re Penny Hoarders. Just because I’m passing on the free salsas doesn’t mean I want to overpay for the store-bought stuff. 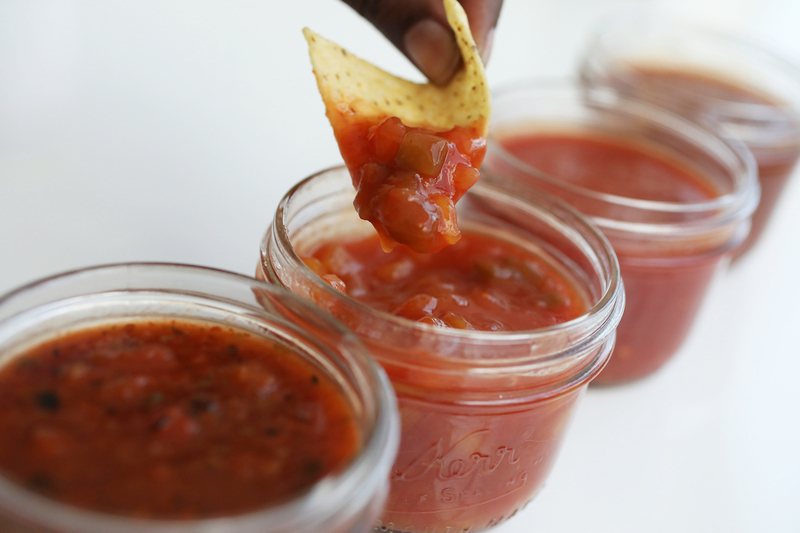 That’s why we headed to Trader Joe’s to try out a few different styles of salsa. The only thing these four bottles had in common was their price point: All four were under $3. We bought all four and tried them out so you won’t waste money experimenting. This complex and flavorful salsa was the group favorite. We had an impromptu taste test in our office kitchen and with very few exceptions, everyone loved this jar. Yes, it’s the most expensive of the bunch, but at 16 ounces, this jar was also the biggest. The others held just 12 ounces of salsa. If you’re a fan of garlic and chipotle peppers, you’ll love this. The only criticism I have is that the label promised me medium spiciness, which I didn’t notice at all. Two co-workers described this salsa as “meh.” Another said this salsa tasted like nothing. I had high hopes for the organic option. While it wasn’t bad, there was nothing particularly exciting about it either. How about we just move along? Trader Joe’s Spicy, Smoky, Peach Salsa costs $2.29. I thought it would taste slightly sweet and a little smoky but still have a bit of a kick. The label promised me all of that. I got none of it. The most offensive part of this wasn’t even its inability to deliver on the label’s promises. The bigger problem was just how sweet this salsa was. It wasn’t just natural peachy sweet. It was overpowering and slightly artificial. After taking a peek at the ingredients, we realized why: TJ’s decided to punch this up with cane sugar. For me, everything would have been much better if it just tasted like peaches. What we got was almost as sweet as peach pie. This may sound good served with fish or chicken, but it’s not what you’d expect on a tortilla chip. But it wasn’t all bad. When it came to texture, this one was my favorite. We got whole chunks of peach with every bite, down to the very end of the jar. This was the simplest and the cheapest of the bunch. And honestly, it was my favorite. Although all four jars were listed as “medium” on the Trader Joe’s spiciness scale, this was the only one that was spicy at all. This is what I expect out of a salsa. While it was not chunky like the peach, it was thick enough to stick to the chip. The only criticism my taste testers had for this one was that the tomato flavor was a bit too strong. The autentica gave me the spiciness the peach lacked while also drastically cutting the sweetness. If you have a couple extra dollars to give to your snack budget, this mix is a win. Desiree Stennett (@desi_stennett) is a staff writer at The Penny Hoarder. This tasting process taught her how basic her salsa choices are. Her favorite non-TJs salsa is Pace Picante. Sad.